As part of the upcoming Ohio Open Doors event, Special Collections & Archives will be holding two behind the scenes tours on September 11 and September 12. The tours will provide attendees a chance to step through the “Staff Only” door and see our stack areas, collection storage, and, of course, letters, diaries, photographs, and other materials from a variety of our collections. 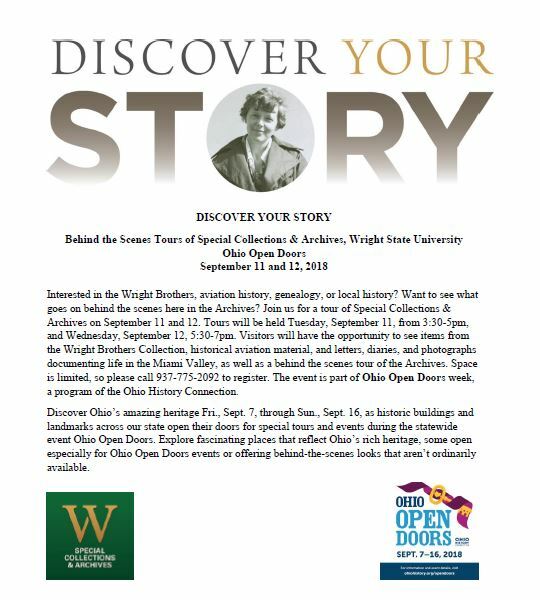 Space is limited, so please call 937-775-2092 or email archives@libraries.wright.edu to reserve a spot. The Tuesday, September 11, tours runs from 3:30-5pm, while the Wednesday, September 12, tour will take place from 5:30-7pm. A visitor parking pass will be provided. Come take a tour and Discover Your Story! This entry was posted in Collections, Outreach and tagged Open Doors, tours. Bookmark the permalink.